The government has commissioned MIT engineers to construct an autonomously run Nuclear Energy Facility. To do this, autonomous robots are charged with the task of running the plant. A properly running plant requires the placement of fresh active energy cells into the facility's reactors. Some energy cells are located at various stations around the facility, and others are located in a centralized Energy Cell Silo. This Silo needs to be checked on a daily basis, so the facility drones are encouraged to extract cells of any kind from it. Placing active cells into as many unique reactors as possible will lead to optimal plant efficiency. Placing dead cells into reactors is wasteful and will not benefit the energy production of the plant. Finally, any dead cells on the facility's floor are considered as hazardous and should be cleaned up. Since many teams have owned up to the challenge and only one team can obtain the government contract, a competitive approach was proposed. Two competing teams are operating in adjacent facilities. The team with the most efficient plant and fewest scattered dead cells will be declared the winner, thus advancing them towards acquiring the contract. The default Facility Walls are white-faced, 6 inches tall, and are lined with 2 inches of blue paint at the top. Knocking these over could lead to the facility collapsing and causing a nuclear meltdown. The Energy Cell Silo is a dispenser containing green and red balls located in a common vessel to both teams. The walls for this container are 4 inches tall and lined with red paint at the top. Both teams can extract balls from this container. The dispensing system will only release one ball at a time into a collection zone. If the ball present is removed, a new ball will be dispensed within 1 second. The Nuclear Waster Interfaces are any walls lined with yellow paint at the top. Teams may dispense their nuclear waste (red balls) onto the opponent.s territory at these interfaces. 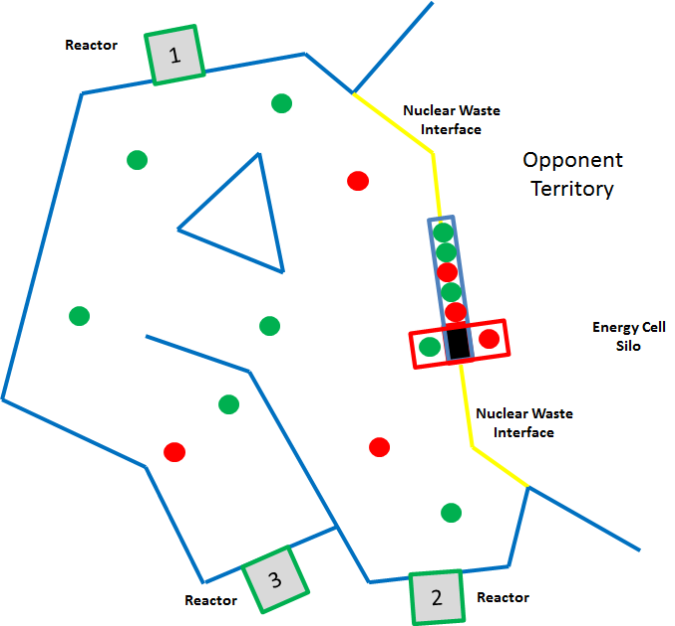 A Reactors tower functions as a location to collect active energy cells (green balls). Reactors are denoted by walls that are lined with green paint at the top. Reactor towers are 6 inches tall and have energy cell repositories on the top (as flat area) and on the bottom (as a mouse hole). Each of the three reactors per side of the map has a unique QR code to identify it. If you have any questions, please contact us at maslab@mit.edu.